Crude prices slipped from last week as concerns lingered over bloated global inventories which remain above 5-year averages. ICE Brent front-month futures fell by $0.45/bbl w-o-w despite news of a 237 kb fall in US crude stockpiles after nine consecutive weeks of gains. Asia is on the cusp of entering the peak of refining maintenance season, with around 2.5 mmb/d of capacity expected to be offline in April, up by 84% y-o-y. Naphtha cracks in Asia grew by 7% on the week as spot and term requirements from regional steam crackers in South Korea, Japan and Taiwan outweighed healthy supplies. The fall in crude prices lent support to naphtha cracks as well. Asia’s gasoline crack fell by 11% w-o-w, in line with the 335 kb/d build in Singapore onshore light distillate inventories. Light distillate stocks hit their highest level in more than a month for the week ending March 15, up by 2.4% from last week. Similarly, US gasoline stocks remained well above the 5-year average despite seeing a draw of 3 mmb for the week ending March 10. Asia’s 500ppm gasoil crack edged down from last week on the back of an ease in demand as well as increased supplies from Taiwan and India. Asian fuel oil cracks dipped w-o-w as heavy Western arb arrivals weighed on the market. According to Thomson Reuters Oil Research, total fuel oil volumes into Asia are expected to account for 7.5 mmt for the third month in a row. In line with the drop in crude prices, Singapore 380cst and 180cst bunker prices were down by $18.50/T and $23.00 /T respectively w-o-w. Ex-wharf premiums were up by $0.08/T from last week. Singapore bunker sales in February expanded by 9.6% y-o-y to 3.85 mmt despite February being a typically slow month. 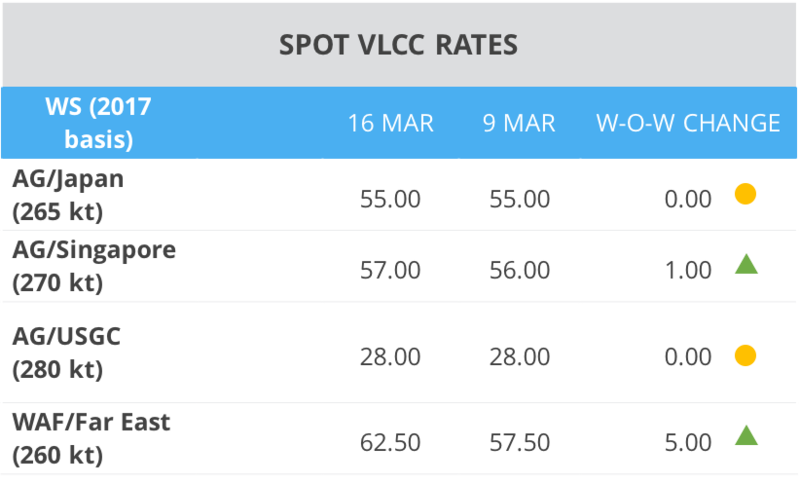 The Asia VLCC market was subdued this week, with rates for the key AG/Japan route languishing at w55 on the back of a dearth of fresh cargoes as charterers awaited the release of the April Saudi loading program. The pace of fixing activity is likely to pick up next week following the release of April stems, but faces a lengthy tonnage list. 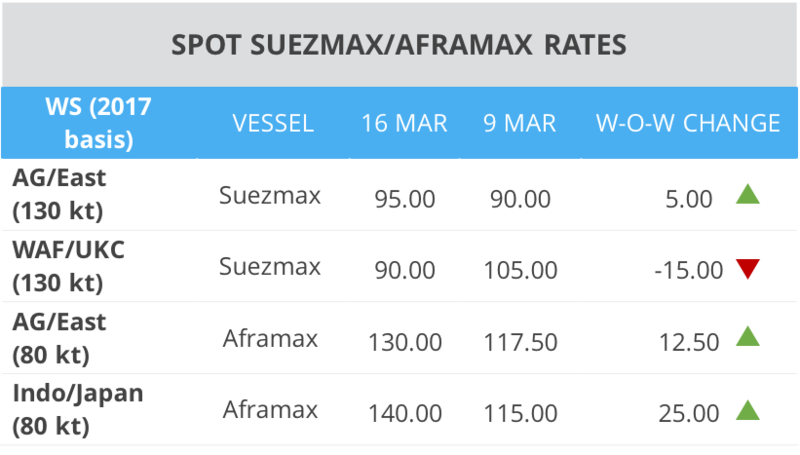 Rates for the WAF/East route recovered their losses from last week, up by w5 points as owners managed to snag a premium for modern vessels amidst the recent strength in the WAF market. We expect the soft AG market to keep a lid on further growth in WAF VLCC rates. The Asian Suezmax market continued firming w-o-w as rates for an AG/East run grew by w5 points to w95. Healthy activity was seen due to fixing for 1st decade April cargoes as well as increased movement along the Singapore-China route. The preliminary Basrah loading program for April was released over the week, with Iraq expected to raise exports by 5% m-o-m to 3.17 mmb/d. The rally in the WAF Suezmax market seems to have come to an end due to an ease in cargo flows, with rates for TD20 down by w15 points w-o-w. The surge in the Asian Aframax market that owners have been hoping for has finally come to fruition. Rates for the AG/East route rose by w12.5 points w-o-w while rates for the Indo/Japan route expanded by 25 points. Owner sentiment is bullish, with a few third-decade March cargoes in Asia uncovered amidst a tightening tonnage list. Port congestion and ullage delays in Singapore due to the high volumes of fuel oil traded in the Platts window since the beginning of March may lend further support to rates. LR2 rates for the key AG/Japan route held steady w-o-w at $16.14/T. The market seems fairly balanced with a tight position list up to end-March and a handful of outstanding cargoes left. LR1 rates continued firming from last week, with rates for the key AG/Japan route up by $1.84/T to $20.17/T as activity remained brisk on the back of a flurry of 3rd decade cargoes. With numerous third-decade cargoes still uncovered, owners seem to be holding out for higher than last done rates. MR rates for the AG/Japan route were stable w-o-w while rates for a South Korea/Singapore run basis 40 kt were up by $20,000 as the North Asia market firmed up.